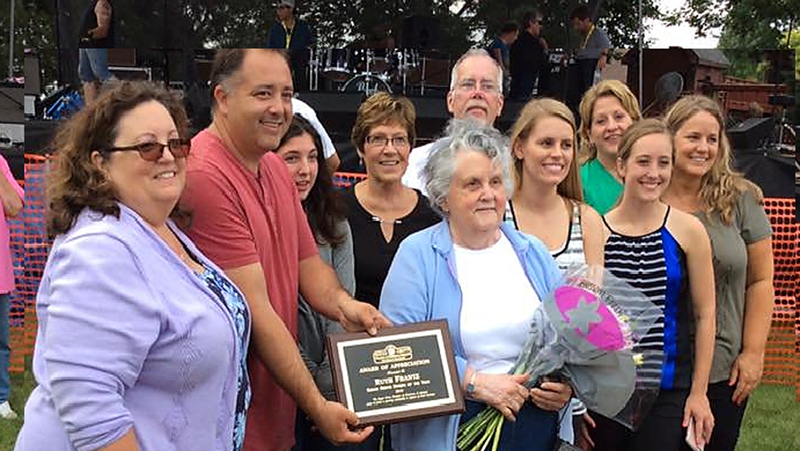 Friday evening, July 29, 2016, as a part of the Sugar Grove Corn Boil 2016 opening ceremony, Sean Michels, Village President and Sally McClellan, Chamber President announced the awarding of the 2016 Sugar Grove Citizen of the Year to Ruth Frantz. Ruth was nominated by colleagues, neighbors, and friends. They cheered from the lawn, as Ruth accepted the award, and joined Michels and McClellan, and those present in front of the main stage. Ruth is well known, respected and appreciated throughout the village for her strong commitment to local history, various historical groups, and genealogy research. She helped organize the Sugar Grove Historical Society and continues to research and share information about the many past events that have taken place in our great town. Ruth also spent over 20 years as the key force for the first Sugar Grove Newspaper where she hand-cranked and printed all copies for the people of Sugar Grove. If it were not for her and her machine, there would never have been any newspapers to distribute. Ruth has and continues to be extremely involved in the Sugar Grove United Methodist Church. She also loved meeting with her garden club in the 60’s where she was able to express her love of flowers. All of her volunteered time and effort is still being recognized throughout Sugar Grove. Without Ruth, many precious memories would have been lost. Clearly, Sugar Grove is blessed to have such a selfless individual in the community. Established in 1998 by the Village of Sugar Grove and the Sugar Grove Chamber of Commerce & Industry as an annual recognition program, “Citizen of the Year” is intended to recognize, from among the nominations, the selected individual or group, which this year best exemplifies that pioneering spirit which helps our village grow and prosper. The Village of Sugar Grove and the Sugar Grove Chamber of Commerce & Industry appreciate the involvement of the many people and local businesses that help recognize the Citizen of the Year recipient. Please click here to download the nomination form from the Sugar Grove Chamber of Commerce website.